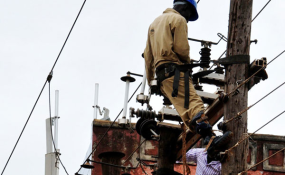 Umeme workers installing a transformer on an old electricity pole in Kampala. Kampala — Uganda's electricity distributor, Umeme, is to invest $155 million during 2018 to among other things, refurbish old networks, build new power sub-stations and improve the network across the country. The firm's Deputy Managing Director, Sam Zimbe, said they have submitted an investment plan for the year 2018 to the industry regulator, Electricity Regulatory Authority, for approval. "Once the plan is approved then we shall embark on executing the projects as planned by the technical people at Umeme," he said. Umeme, whose 20-year concession runs out in 2025, is listed on both the Uganda Securities Exchange and Nairobi Securities Exchange. Umeme recorded a Shs47.5bn net loss during the first half of this year ending June 30, down from Shs54.4bn net profit registered in the same period in 2016 following a decision by the industry regulator to amend the operating licence denying it of extra income from sale of extra units of electricity beyond the set target.